Katerina Nash (Clif Pro Team) is on a roll early this season. 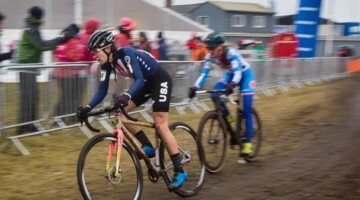 Nash showed no fatigue from her winning ride at the Jingle Cross World Cup on Sunday in winning Wednesday night’s Clif CrossVegas. 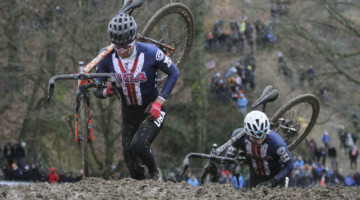 Perhaps fittingly, given Clif’s sponsorship of the race, Nash and Catherine Pendrel (Clif Pro Team) broke off from a big group in the third lap, and then Nash attacked through the uphill sand pit in lap four to get her winning gap. 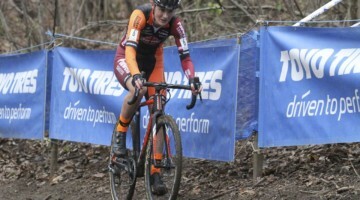 Pendrel soloed for second, and Ellen Noble (Aspire Racing) beat out four other riders in the chase to take home the third podium spot. Stay tuned to Cyclocross Magazine for a full race report from Las Vegas.